Opioids are a mainstay in treating many kinds of pain but are accompanied by troubling side effects and abuse potential that limit their use. The search for opioids that can deliver analgesia without these adverse consequences continues to be a major focus of pain research. A new study, led by Gavril Pasternak and Ying-Xian Pan, Memorial Sloan Kettering Cancer Center, New York, US, reports that a truncated μ-opioid receptor (MOR) isoform with six transmembrane (6TM) domains rescued pain relief in a new knockout mouse missing all splice variants of Oprm1, the gene that encodes MOR, and did so with reduced side effects. The findings were published July 1 in the Journal of Clinical Investigation. “[The authors] provide an in vivo proof-of-concept demonstration that a 6TM isoform of the µ-opioid receptor can support functional analgesia in Oprm1-deficient animals,” wrote Michael Iadarola and colleagues, National Institutes of Health, Bethesda, US, in a commentary accompanying the new study. “The 6TM isoform was pharmacologically distinct from the canonical 7TM [seven transmembrane] μ-opioid receptor, and 6TM agonists had a reduced side effect profile, which confers a strong therapeutic advantage over standard opioid analgesics. The observations ... extend the reach of opioid-receptor neurobiology and pharmacology into a new era of analgesic discovery,” they continued. “Overall, the new findings represent a novel concept in opioid analgesia and will spur much future research,” said Nathaniel Jeske, University of Texas Health Science Center at San Antonio, US, who was not involved in the study. The new work builds on Pasternak and Pan’s previous identification of a new class of opioids that do not act through the same mechanism as traditional opioids and lack many of the typical side effects of opioids such as respiratory depression, dependence, and reward behavior. Belonging to this class is 3-iodobenzoyl-6β-naltrexamide (IBNtxA), which was used in the current study and originally synthesized by co-author Susruta Majumdar, Memorial Sloan Kettering Cancer Center (Grinnell et al., 2014; Majumdar et al., 2011; also see PRF related news story). Rather than targeting the full-length, 7TM-containing MOR variants associated with exon 1 of Oprm1, the new drugs act on variants of MOR that are generated by alternative pre-mRNA splicing. Replacement of a portion of exon 1 by amino acids encoded by exon 11 results in a 6TM variant, because exon 11 lacks a TM domain. Previously, the group found that knocking out truncated 6TM receptors in mice resulted in complete loss of IBNtxA analgesia (Majumdar et al., 2011). The analgesic actions of a subset of μ-opioids such as heroin, the morphine metabolite morphine-6β-glucuronide (M6G), and fentanyl were also diminished, Pan said (Pan et al., 2009). These results suggested that 6TM receptors play a role in mediating the analgesic effects of these drugs. In the current paper, the researchers performed a gain-of-function study, re-expressing the 6TM receptor in a complete MOR knockout mouse missing all Oprm1 splice variants, made by targeting the coding regions of exons 1 and 11 and adjacent intron regions. This mouse model allowed them to study the contribution of individual splice variants to analgesia. “The initial knockout studies showed that the 6TM protein was necessary [for analgesia]. [Here] we wanted to make sure that the protein was sufficient” to induce analgesia on its own, Pasternak explained. Using a radiant heat tailflick assay performed 30 minutes following subcutaneous opioid administration to measure analgesia, the researchers found that, as expected, even at high doses none of the opioids targeting MOR that they tested (including IBNtxA) produced an analgesic effect in the complete MOR knockout mouse. They also failed to observe other common opioid-related behaviors such as hyperlocomotion. Compared to wild-type mice, knockouts also displayed 80 percent less binding of 125I-IBNtxA (which binds to both 6TM and 7TM receptors), with residual binding representing cross labeling of δ-opioid receptors, Pasternak said. They also showed 90 percent less binding of 3H-[D-Ala2,MePhe4,Gly(ol)5]enkephalin (DAMGO), which binds only to traditional 7TM receptors. Together, these results suggested a loss of both full-length and truncated receptors in the knockouts. Next, to determine if the truncated MOR splice variant could restore analgesia, first author Zhigang Lu and colleagues generated a lentivirus expressing a 6TM variant called mMOR-1G (the predominant 6TM variant in the spinal cord, where IBNtxA acts) as well as an enhanced green fluorescent protein (EGFP) marker. Expression of the virus, which was injected on days 1, 3, and 5, was seen as soon as one week following intrathecal administration, peaked after four weeks, and persisted at stable levels for at least 14 weeks. Injection of the lentivirus into the knockout mice increased 125I-IBNtxA binding, but not binding of 3H-DAMGO, a radiolabeled δ-opioid receptor ligand, or a radiolabeled κ1-opioid receptor ligand, indicating that the mMOR-1G-expressing lentivirus restored the binding of 125I-IBNtxA to an exon 11-associated target. 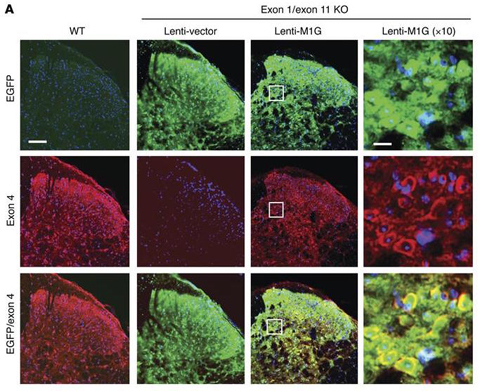 This also had functional consequences: while knockout mice infected with a control virus lacking mMOR-1G continued to show no IBNtxA-induced analgesia, those that received the mMOR-1G-containing lentivirus began to display analgesia one week post-infection. This effect peaked after three weeks and remained stable for a minimum of 14 weeks. “Together, these studies indicate that 6TM splice variants are necessary and sufficient for IBNtxA analgesia,” Pan said. Based upon the group’s previous studies with IBNtxA (Wieskopf et al., 2014), exon 11 targets are capable of a broader spectrum of analgesia than traditional opioids, are at least as potent against inflammatory and neuropathic pain as against thermal pain, and lack three of the major problems of current opioids—respiratory depression, physical dependence, and reward behavior, said Pasternak. “Thus, the truncated 6TM receptor represents a target for developing new opioid drugs,” added Pan. One caveat of the current study is that the expression profile of the 6TM variant following lentiviral transduction may not mimic that of the endogenous 6TM variant found in humans or mice, said Jeske. “It’s difficult to determine whether or not the effects they were able to see with lentiviral transduction are synonymous with what would happen physiologically if they were able to design drugs that would target only the endogenous 6TM target,” he explained. “With that note, though, this is probably the most ingenious and direct way to investigate the hypothesis that 6TM opioid splice variant receptors exist physiologically as viable drug targets to provide analgesia without negative side effects caused by typical opioid drugs,” Jeske added. Future studies will be aimed at understanding the molecular aspects of the opioid 6TM targets, discovering how these targets fit within an integrated circuitry of the nervous system, and designing and synthesizing novel compounds able to take advantage of 6TM targets, Pasternak said. J Clin Invest. 2015 Jul 1; 125(7):2626-30. Epub 2015 May 26. A new splice of life for the μ-opioid receptor. J Clin Invest. 2015 Jul 1; 125(7):2558-61. Epub 2015 May 26.